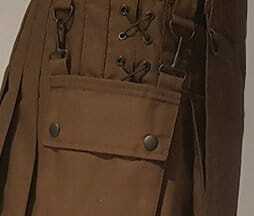 What fastening systems are available on your kilts? A Velcro along the front apron belt line which can be adjusted for a perfect quick fit. Kilts with our Velcro fastening also come with criss-cross flexible elastic pleats either side of the kilt to add extra comfort and longevity to the garment, each kilt with flex-pleats also contains detachable pockets. This highly versatile fastening system allows for a great range of movement, especially for those sitting, running, or working in their kilts. Offers 3 size settings. Not as quick or easy to fit and remove as Velcro , a slightly more rigid fit when compared to the kilt with the Velcro Fastening System with Flex Pleats. We no longer produce these as standard across our range in favour for the above two more versatile and modern fastening systems, however we can take bulk special orders, so just send us an email and we will see what we can do. How adjustable are your Kilts? 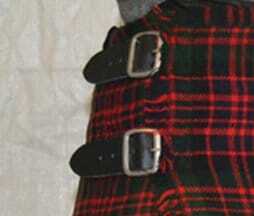 Our Leather Strap + Velcro kilts now offer a huge 5 inches of adjustment in approximately 1 inch increments. Please note: Sizing is subject to a manufacturing variance of approximately 1.5inches (this is fashion industry standards), and while the adjustments up or down are not ‘exactly’ 1 inch, more often than not they offer a perfect level of adjustment for comfortable wear, no matter how big of a Sunday Roast you have just gotten through. 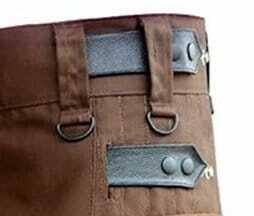 It is important to note however, our Velcro Fastening Kilts offer a bit more granular adjustment. Our flex pleats that come with our velcro give about .5-1 inches of flexbility around the hips (great for sitting, standing, walking etc). The Elastic lace is also easily replaceable (and inexpensive) should it wear over extended use. Whats this I hear about FREE SHIPPING??? Am I eligible? All our orders throughout the world are eligible for free shipping! So YES, just place your order and we will create your beautiful new kilt, and ship it to you using our Hand Picked Delivery Partners. For items in stock (if you are placing a back order you will be informed during purchase), our usual dispatch time is just 1 business day from date of order, once shipped, we will email you letting you know, you can then log into your account on our website and use our parcel tracking system to track your delivery! If you ever have an issue with your parcel just get in touch with us at eden@ozkilts.com and we will get you sorted! Our average delivery time is now only 3-5 business days from the date of dispatch. Notes on REMOTE LOCATION deliveries: Any residences defined as being located in remote areas according to our delivery providers, may incur a surcharge for delivery. If you live in a remote area, we attempt delivery and it is rejected by our carrier as being a ‘remote area’, you may be required to pay a remote surcharge in order to receive delivery of your kilt (We simply pass the these fees on from the delivery providers, we have seen these fees be up to 30-40 USD in some really remote area situations, however this is rare). We will not offer refunds on orders already purchased because of delivery issues if you live in remote areas, did not collect the package, or didn’t enter correct delivery details. If you are concerned about this please contact us prior to placing an order.